Publications of NEC Experts – Центр "Нова Європа"
This article analyses the role of Germany in resolving the conflict between Ukraine and Russia from Kyiv’s perspective. After the Russian aggression, Ukrainian decision-makers appeared to be suffering dramatically challenging conditions, no longer able to rely on international law, and with all the multilateral security frameworks invalidated. The objective of the initiative is to study the mutual interests of Ukraine and its strategically important partners in order to develop recommendations for a proactive foreign policy for Ukraine. The study analyzes security options for Ukraine based on five models: cooperation with NATO, regional security pacts, armed neutrality, bilateral security instruments, and the asymmetrical model. The analysis of the communication strategies used in Ukraine, Moldova, and Georgia in order to increase public awareness on the Association Agreement and DCFTA with the special focus on the experience and lessons of the Visegrad Group countries. The study analyzes the international experience in settling conflicts, and develops concrete recommendations to facilitate the implementation of the Minsk agreements. This paper aims to provide the successful tools that were used in Moldova, Ukraine and Georgia, and advise on how to improve certain aspects that would lead to a more efficient implementation of the Association Agreements, as well as to demonstrate possibilities for effective monitoring and evaluation with existing examples. The authors examined the role of the peacekeeping mission in Transnistria and its evolution over last 22 years. Experts also analyze several scenarios of reforming it in the context of events happening in Ukraine and their impact on Moldova. The paper is a result of joint efforts of Ukrainian and Russian experts to elaborate common vision about future of Ukrainian-Russian relations and define scenarios of the development of bilateral relations. Ukraine-NATO: a Hidden Integration or Undeclared Neutrality? NATO and Ukrainians: Does Public Opinion Matter? How does post-sovietness become apparent in politics and everyday life? How to minimize its harmful effect for development of european nation? By the post-sovietness we mean the form of the socio-political mutation, when the old soviet values and models of behavior combine with the Western equivalents. The study estimates the potential of Ukraine’s soft power in six states, EU Member States Poland and Romania, Ukraine’s partners in European integration Moldova and Georgia, and in the neighbours in the North, Belarus and Russia. The New Europe Center asked diplomats, military officers, lawyers, and scholars to assess the degree of risks and threats to Ukraine both in the event of denunciation of the agreement, and in the case of its survival. This memo should contribute to a balanced approach to the final decision. During the preparation of this analytical document, we used the Center’s own expertise, as well as expert assessments by Andriy Ryzhenko, Borys Babin, Volodymyr Vasylenko, Anton Korynevych, and Tymur Korotky. What are the windows of opportunities for Ukraine in today’s project, and what should be the general approach of Ukraine to the Three Seas Initiative? Analysis of foreign policy preferences of the citizens of Kharkiv. Ukrainians will consider European integration to be successful if they see improved services in local hospitals, renewed roads in their settlements, while EU membership is not fundamental for most respondents. 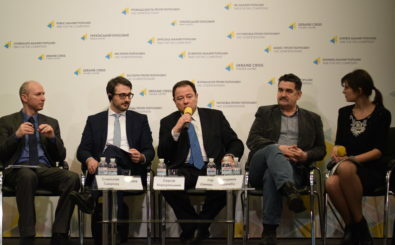 This was told during the presentation of the opinion poll that was held in May 2018 by sociological company GfK Ukraine at the request of the New Europe Center. Ukrainians are generally convinced of the need for assistance from the EU and the US. Quite an insignificant number of citizens oppose receiving assistance from the Western governments. The largest portion of those who would abandon external support resides in the East of Ukraine. These are the answers to the questions offered by the New Europe Center within the framework of an opinion poll conducted by the Ilko Kucheriv Democratic Initiatives Foundation and the Kyiv International Institute of Sociology from August 16 to 28, 2018. 2,041 respondents have been interviewed (the marginal error is 2.3%). Based on public discussions in Odesa and Kherson, as well as a series of interviews with local representatives, this paper is looking into the political, security and economic nuances of the two oblasts, which formally belong to the same region, but have their own peculiar attitudes towards political and economic developments in Ukraine.